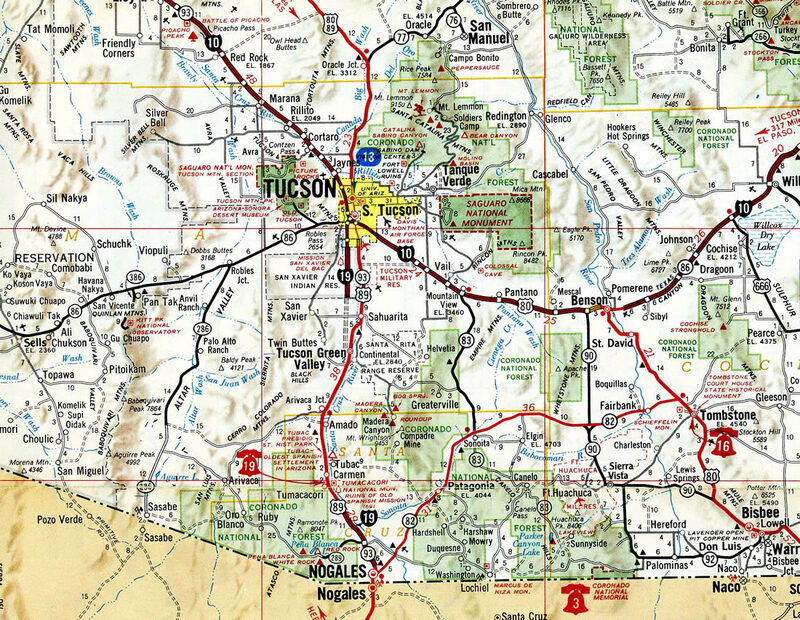 Interstate 19 is a short route in southern Arizona that connects Interstate 10 and Tucson with Nogales and Mexico. The freeway curves west around Crawford Hill from Grand Avenue (old U.S. 89) and the international border to bypass Downtown Nogales north to Arizona 189. North from Rio Rico, I-19 parallels the Santa Cruz River to Tubac, Green Valley and the south suburbs of Tucson. The lone six lane section joins Arizona 86 with Interstate 10 at South Tucson. With the establishment of Intertate 14, I-19 is now the fourth shortest two-digit route within the Interstate system, ranking above I-2 and I-97. The section of Interstate 19 from Nogales to Tucson is part of High Priority Corridor 26: CANAMEX Corridor. Interstate 19 ultimately replaced the original routing of U.S. 89. Some old segments of U.S. 89 at Tucson and Nogales were incorporated into Business Loops for I-19. 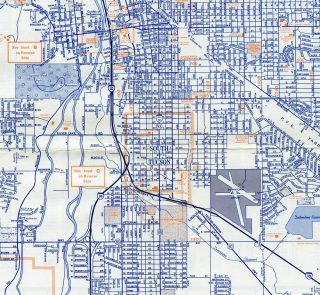 The Tuscon business route was eventually decommissioned. Interstate 19 opened initially from Rico Rico Drive (Exit 17) to Palo Parado Road (Exit 25) in 1966. The freeway was completed in 1979 when the section from Tubac (Exit 34) to Chavez Road (Exit 40) opened to traffic. See the I-19 Arizona guide for the rest of the time line. One of the unique features of Interstate 19 is that most of the exit numbers and distance signs are based on the metric system, a first for the U.S. Interstate system. The use of metric units along I-19 was the result of a President Carter administration pilot project aimed to have the United States adopt the system. The metric units also served as a hospitality measure for Mexican tourists headed north to Tuscon and Phoenix. 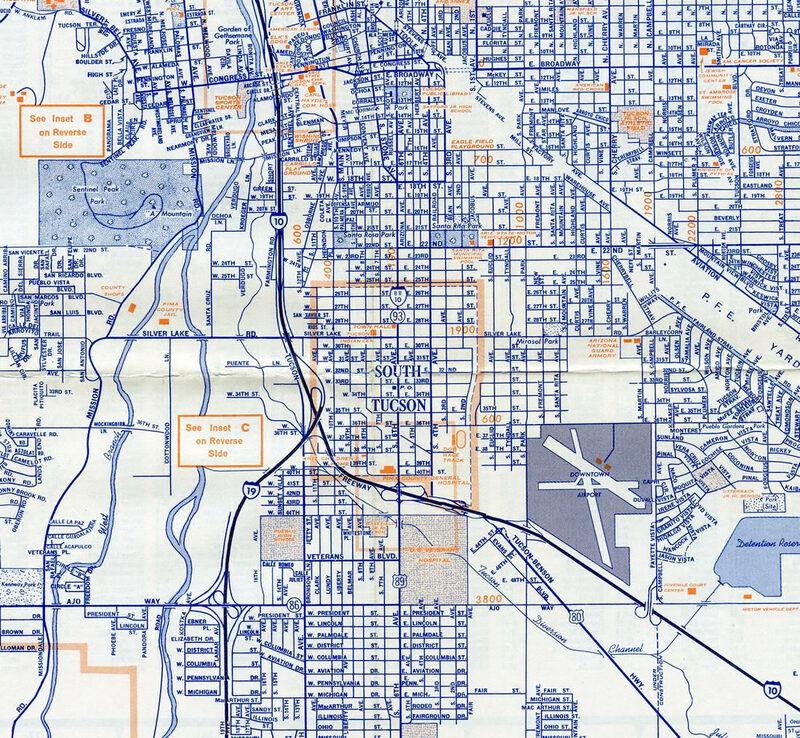 Initial portions of I-19 ran south from I-10 to Valencia Road (Exit 95) by 1965 and between Mariposa Avenue (Exit 4) and Palo Parado Road (Exit 25) by 1968. U.S. 89, truncated south of Flagstaff as approved by AASHTO on June 15, 1992, was designated as Business Loop I-10 north of I-19 and as Business Loop I-19 south of I-10. The I-10 business loop was eventually decommissioned by the late 1990s. Suburban frontage lines both sides of Interstate 19 from Irvington Road north to Ajo Way and Arizona 86. Button copy guide signs previously posted along this stretch were missing shields for both I-10 and AZ 86. Photo taken by Eric Harkness (04/02/05). Interstate 19 north at the Ajo Way off-ramp (Exit 99), ahead of construction for The Crossing at I-10. Arizona 86 travels westward to the Tohono O’odham Nation to end at Arizona 85, 12 miles from the community of Ajo. Photo taken by Eric Harkness (02/01). New signs were posted following the completion of The Crossing project along Interstate 19 north. The addition of Exit 102 provided access to Silverlake Road independent of the westbound mainline for I-10. Photo taken by Eric Harkness (04/02/05). Two lanes default onto Interstate 19 west toward Phoenix as Exits 101 and 102 part ways from the right-hand lanes. I-10 angles southeast from South Tucson to Davis-Monthan A.F.B. while a frontage road north connects I-19 with 29th and 22nd Streets nearby. Photo taken by Eric Harkness (04/02/05). An interchange sequence sign was the first indication for Interstate 19 south along I-10 east ahead of Exit 259. This stretch was reconstructed in 2008, with I-10 raised and expanded. Photo taken by Eric Harkness (04/02/05). Button copy guide sign posted for Interstate 19 south, prior to The Crossing project rebuild. This stretch of Interstate 10 was heavily traveled with over 150,000 vehicles per day recorded at the time. Photo taken by Eric Harkness (07/01). Interstate 10 continues east from Tucson to Las Cruces, New Mexico and El Paso, Texas while I-19 leads through the south suburbs and Green Valley. Photo taken by Eric Harkness (04/02/05). Beyond Tucson, Interstate 10 travels to Benson in Arizona. Interstate 19 south remains within the Tucson Metropolitan area for approximately 23 miles. Photo taken by Eric Harkness (04/02/05). Passing under 6th Street (former U.S. 89 and Business Loop I-19) south, one half mile ahead of Exit 20 for Interstate 19 south to Nogales and Sonora, Mexico. Photo taken by Eric Harkness (04/02/05). A high flyover takes travelers south from I-10 west to Interstate 19 south at Exit 260. All guide signs here were replaced to use Clearview font after 2008. Photo taken by Eric Harkness (04/02/05). 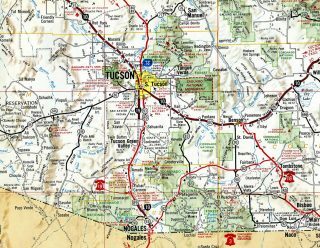 All trucking interests to the country of Mexico are directed to use Arizona 189 (Mariposa Road) south from Interstate 19 at Mariposa and Exit 4. The freeway continues south another 3.1 miles to west Street. Photo taken 05/25/03. Western Avenue crosses paths with Interstate 19 at Exit 1B near Ephraim Canyon. The remaining 1.1 miles of I-19 curve east around Crawford Hill to Sonoita Avenue for Downtown Nogales. Photo taken 05/25/03. Exit 1A departs in a third of a mile for International Street, which parallels the border west from Sonoita Avenue to a nearby neighborhood. Interstate 19 ends in 0.6 miles otherwise. Photo taken 05/25/03. Cerro Pelon rises in the distance as Interstate 19 turns east to the Nogales street grid at West and Compound Streets. Photo taken 05/25/03. Speed limits reduce to 25 miles per hour as the freeway transitions onto Compound Street through a commercial area west of Downtown Nogales. Photo taken 05/25/03. Although unmarked here, Business Loop I-19 begins and follows Compound Street east and north to Sonoita Avenue north and Crawford Street east to Downtown Nogales. Photo taken 05/25/03. Crawford Street takes Business Loop I-19 two blocks east from Sonoita Avenue to Arroyo Boulevard / Grand Boulevard (old U.S. 89). The International Border crossing is located just to the south. Mexico Federal Route 15 connects Nogales, Sonora with the provincial capital of Hermosillo. The highway continues southward all the way to Mexico City, some 1,350 miles to the southeast. Photo taken 05/25/03. There are no signs marking the freeway beginning of Interstate 19 on Compound and West Streets. I-19 meets Western Avenue in 0.6 miles. Photo taken by Eric Harkness (07/01). “Some I-19 metric signs going,” Tucson Arizona Daily Star, January 19, 2004. “Arizona highway signs in metric units may change.” The Arizona Republic, October 5, 2014. Building the I-10/I-19 Traffic Interchange, http://www.1019crossing.com Arizona Department of Transportation project web site. Southcentral Districts Projects – Interstate 19: Ajo Way Traffic Interchange. Arizona DOT project web site. Accessed April 21, 2017. Page updated April 21, 2017.